Light aircraft flights (instead of driving) between the game viewing regions, land a short distance from the safari camps allowing you more time for photography and game viewing. This also allows for greater distances to be covered on your safari and the flying itself is a highlight and offers excellent views of the African wilderness. The fly-in safaris allow you to mix quite a bit with fellow travelers too, even though you are not part of a group as such, you meet up with interesting people at the various lodges, where meals are taken together and there is ample opportunity for socializing. It has been my experience that game viewing, especially for big game and cats, is best on a fly-in safari, or at least it is more consistent. The guides at the camps more or less know where game is concentrated at any particular time, and the various vehicles out on game drives are in radio contact, so everyone is alerted to sightings of special interest. 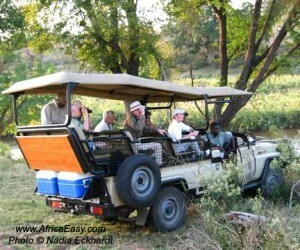 Travel by road between safari camps is the more traditional and economical way. A ranger-driver will be with you and take care of the driving and guiding all of the way. Accommodations are either permanent or mobile tented camps. One can also opt to do more active safaris, which involve walking, canoeing and hiking out to some of the more remote regions in Africa. This option is a little more rugged, but offers unique experiences and some exciting wildlife and wilderness experiences. In almost all itineraries, safari is the most expensive component of a trip to southern Africa. Various factors play a role in one’s choice of safari destination, and for most people, cost is one of the many criteria that influence this important decision. The safari market in southern Africa is highly competitive and driven by supply and demand. There are very few pricing anomalies. CONCENTRATION OF GAME – One of the main reasons a particular lodge or safari camp costs so much is the concentration of high-profile game, namely the Big Five and predators. SERVICE & ACCOMMODATIONS – The standard of the lodge accommodations, as well as the quality of food and service, facilities and ambiance, affects the cost at certain lodges and safari camps. The more expensive properties invariably excel in these elements of the overall experience. EXCLUSIVITY – As a rule, the larger and more private the concession/reserve, the higher the premium. Botswana, where private concessions are typically 100,000 acres or larger, are the most prominent example of this model of low volume/high value eco-tourism. The Africa Easy costs throughout the site are quoted on a per-person sharing basis. Single travelers almost always pay an additional single supplement of up to 60 percent. The tours are fully inclusive, starting and ending at the airports listed. For the most part, rates include charter flights, accommodations, most meals, activities, laundry, park fees, services of a professional guide and bottled water. International and domestic scheduled flights to and from the starting and ending points are not included. Our rates are based on travel in peak season.